I found a lot of brief stories to ponder in the JN of Sept. 18, 1942. Indeed, along with the usual reports of Nazi evil, this issue had a wide-range of interesting reports. One story reflected a question posed in a JN editorial from Aug. 25: Should Jews involved in crucial war production observe the High Holidays? A headline on page 13 showed that, locally, a conclusion had been reached: “Detroit Rabbis Approve War Workers keeping the Holydays.” They recommended that, “If possible, Jewish workers whose consciences lead them to spend these days in religious devotion should seek some method by which they can later make up the production time lost.” This tells me that the rabbis understood just how critical war production was to the nation. 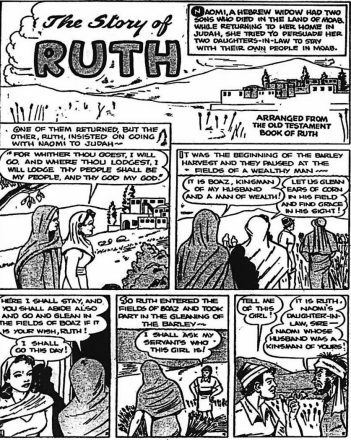 There was a new feature on page six, the “Story of Ruth” in the form of a comic strip. 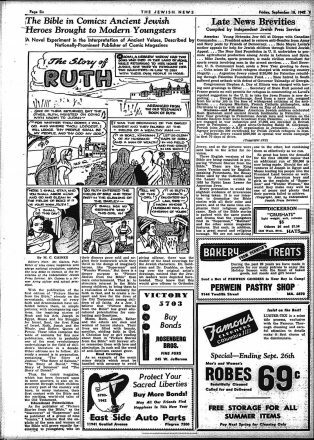 This was billed as “The Bible in Comics: Ancient Jewish Heroes Brought to Modern Youngsters.” It was described as a “Novel Experiment” by M. C. Gaines, publisher of nine comic magazines with biblical themes. 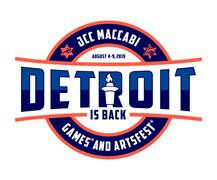 There was a brief item noting that Yom Kippur music would be aired on WWJ. This would be during a primetime radio slot, no less, from noon-12:30 on Sunday. 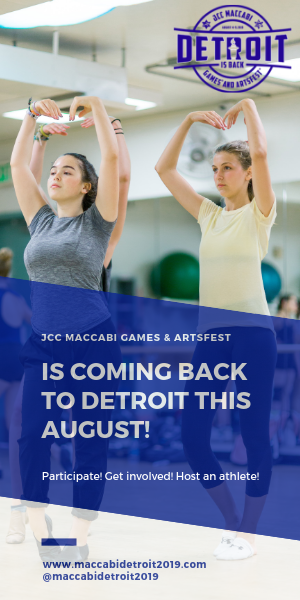 And, on the page devoted to “What’s happening in Detroit,” there was an article devoted to three faiths — Jews, Catholics and Protestants — condemning intolerance. I would argue this condemnation is still needed today. Finally, my favorite headline: “King of Denmark Attends a Synagogue to Defy Nazis.” I don’t know much about the history of King Christian, but one thing is sure — in the face of overwhelming power, he showed some real guts.